Flimm, a.k.a. 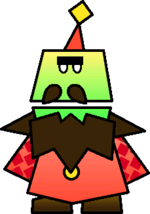 Freelance Sales Freak, is a traveling salesman from Super Paper Mario much like Charlieton from the previous game. His Flopside counterpart is the map-selling Flamm, and together, their names are derived from the word "flimflam", which means "a swindle". Flimm sells many rare items not found in stores, for example a Thwomp Catch Card. He is found on the B1st floor of Flipside. He also may appear in the Flipside and Flopside Pit of 100 Trials at every 10th room. It is unknown how he progressed through the pit. Flimm's sell prices for his items are 75% of what they would normally be, if they have a sell price at all (Turtley Leaf and Golden Leaf, for example, cannot be bought) and this applies to all catch cards. Even the Shooting Star is 75% of what he would sell it for in The Pits of 100 Trials. In the Flopside Pit of 100 Trials, Flimm will occasionally sell things for double their normal sell price. This page was last edited on February 20, 2018, at 12:41.